Easy Care:SolSport is light, yet can be washed and dried in regular cycle. Great for:Tennis, Pickleball, Hiking, Fly Fishing, Boating, Sailing. Mesh Venting:Mesh inserts create a billowing effect while walking. Keeping you cool and comfortable. SanSoleil's newest Men's fabric, SolSport, reduces the body temperature by 5%! SanSoleil's SolSport fabric which offers permanent cooling and UV 50 protection. This Long Sleeve Button Polo also offers stretch and is extraordinarily light. Easy care too! Perfect for an afternoon of golf in the blazing sun! CHEST M 40" L 42" XL 44" XXL 46"
SanSoleil. Sun Care You Can Wear. Golf Tennis and Sports Wear. 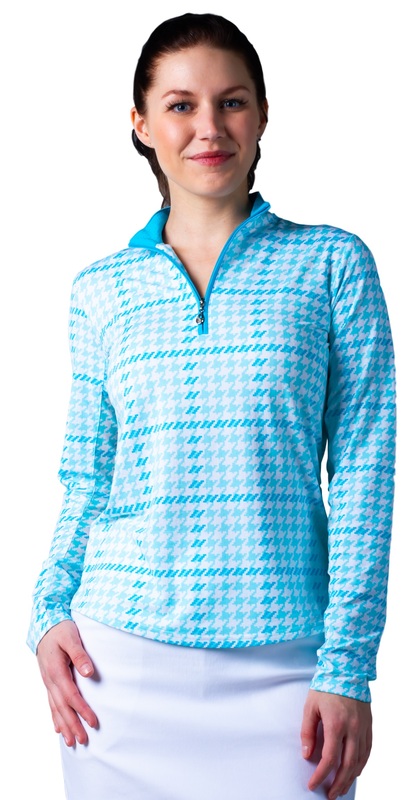 UPF 50 fabrics which do not lose their sun protection functionality over time. SanSoleil SolSport Fabric features quick dry, quick cool, easy care and UPF 50 protection. The fabric is spun with 8% Spandex for athletic Stretch. SolSport offers permanent cooling and sun protection.